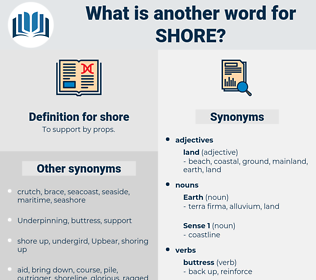 What is another word for shore? shorebirds, shoreline, coast, coasts, coastline, beach. 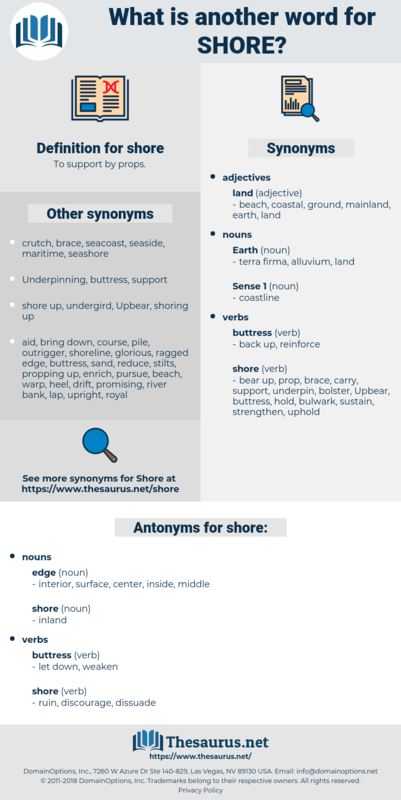 shoreline, shorebird, foreshore, riverbank, nearshore, coast, seacoast, edge, seaside, coastline, riparian, beach, rib, disembarkation. strengthen, bolster, backstroke, swim, reinforce, reinforcing. interior, surface, center, inside, middle. After a storm we found ourselves washed up on this strange shore. Shore that sounds reas'nble to me. lakeshore, coast, sea-coast, strand, seashore, lakeside, seacoast.